There is, unfortunately, a recent trend of brutalist architecture being demolished, particularly in the UK. Our investigations into some of the UK’s best brutalist buildings over the past four years has seemed increasingly focused on buildings that are either due for demolition or sadly already lost. But this has inspired us to create a range of artwork that mourns these losses and emphasises them being “Missing”. Our first blog on this series revisits where is all started for us. Birmingham Central Library. 3D layered elevation study in black card. Birmingham Central Library was opened in 1974 as part of a new civic centre scheme located in the west of Birmingham’s city centre. The building was designed by Birmingham architect John Madin as part of a vision to modernise the city. It was the first of a new kind of library which acted as a multi-functional complex including a theatre, lecture rooms and adaptable spaces to allow for the predicted changes in how public libraries would work in the future. When opened it was the largest non-national library in Europe and its inverted ziggurat form made it one of Birmingham’s most prominent modernist buildings. At the time of construction Central Library’s style was seen as one that championed social progress. A holistic approach to design which utilised classical proportioning for the monumental massing, along with clean and well sequenced spaces and early environmental considerations produced a seminal public scheme for a modern city. Unfortunately the overall vision was never realised and due to economic difficulties the building’s materials were reduced in quality and surrounding plots were sold off for separate developments. The modernist form of the building and bold contrast to the surrounding Victorian architecture have made it controversial, with many taking a dislike to it. But even still it has become an icon of brutalist architecture in Britain and with both English Heritage and The Twentieth Century Society recommending Grade II listing status it was a huge disappointment to see the short-sightedness of the city council and planners destroying a significant part of Birmingham’s recent history. Birmingham Central Library was one of the first libraries to be designed as a complete cultural centre. The original design included exhibition facilities, lecture halls, and a theatre, as well as a music department, drama centre, athletic institute and a bus interchange. The masterplan vision proposed a collection of civic buildings that would be connected by a network of high-level walkways to expand the public space over the roads – providing a fully integrated transition through this part of the city. Most of this was never completed as the council’s spending cuts led to the sale of land surrounding the library. This destroyed the vision of a publicly financed and owned civic centre. 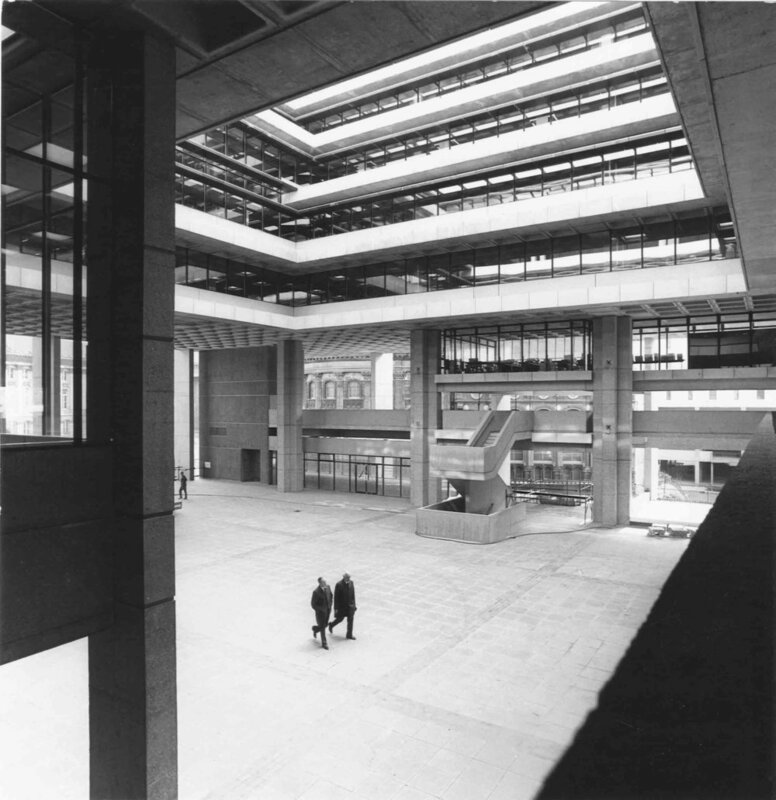 John Madin’s design took a classical approach to the proportioning of the building’s mass, but used it in a strong brutalist style that was then reinforced by the heavy structural materials. The building’s context was well considered, with its height paying respect to the surrounding town hall and council house and a clever design of spatial sequences to connect views across public spaces and throughout the building. Later developments of the building at the end of the 1980’s saw key spaces enclosed and compartmentalised for easier subletting. 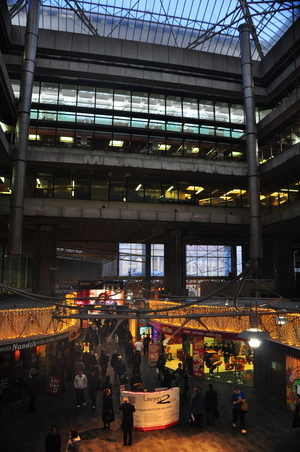 In 1999 the council sold off the whole of Paradise Forum to a property developer and this privatisation severely impacted upon the public experience of the building’s spaces, making it more like an uninviting, monetized fortress rather than the grand civic experience for which it was designed. The poor management as well as a lack of maintenance gave opportunity for a hasty decision to demolish for the purpose of development. English Heritage applied twice for the Library to be grade II listed in 2002 and 2007. They identified the building as the largest civic (non-national) library in Europe. Describing it as having a boldly confident exterior that defines an era of Birmingham’s recent history. It was also said that the careful internal planning maked it a successful example of an integrated modern facility. The building was also included on the watch list of the World Monuments Fund, identifying it as an iconic building in the hope that attempts would be made to preserve it. However these recommendations were rejected by the Minister for Culture who said “the building did not have sufficient historical or architectural importance to merit listing”. Many were disappointed by this decision, including some who were previously indifferent to the design but recognised it as an important Birmingham icon in the realisation that it would be no more. "The Twentieth Century Society is tremendously disappointed by the Minister’s decision not to follow the advice of English Heritage and list Birmingham Central Library. EH advice on listing is not often overturned and this is a key case in that regard. Minister Margaret Hodge has made no secret of her personal dislike for post-war buildings and has here failed to understand the basic premise of heritage protection in England. Listing Birmingham’s impressive brutalist library would not prevent renovation work, or even a well-designed radical makeover. Libraries need to be flexible as the services they provide will continue to evolve. We believe not only that the Central Library is historically and architecturally significant, but that it is capable of being adapted for the needs of 21st century Birmingham. What listing would do is make sure that proposals took into account the historic interest of these structures rather than seeking to change or even demolish them. One of the key strengths of our heritage system is that listing is decided purely on the basis of architectural or historic interest. This then allows a detailed analysis of economic viability and wider social issues to follow. This works very well and any problems that occur generally reflect lack of skills, experience and confidence of local authority planning departments and committees. The process does not require Margaret Hodge to fix it. BCL, designed by one of Birmingham’s most accomplished architectural sons, John Madin, could have another life. The Twentieth Century Society will continue working alongside the local groups who have done so much to push the debate forward." "The Birmingham Library, designed by John Madin and opened in 1974, is the largest civic (non-national) library in Europe. Its boldly confident exterior defines an era of Birmingham’s recent history, and its careful internal planning makes it a successful example of an integrated modern facility. English Heritage believes that the Library is worthy of Grade ll listed protection. Listing identifies whether a building is nationally important and not whether it must be kept. It is not a preservation order, simply a mark of special interest. Listed buildings can still be demolished once the case has been made and all other options have been explored. We have been working with the City Council throughout, and maintain an open dialogue with them. In offering the Government our expert advice, we examined all aspects of its architectural interest including: whether it fulfilled its brief; whether it was a particularly good example of a public library; how well it survives; how it compares to other listed buildings of a similar type; and how influential the building has been. In our view, these tests were met. We are naturally disappointed that Margaret Hodge on behalf of Culture Secretary Ben Bradshaw came to a different conclusion and we believe many local people will be too." Birmingham Central Library was designed with an outward facing lending section – wrapping around the amphitheatre of Chamberlain Square – and an inward facing reference section around a large public atrium. 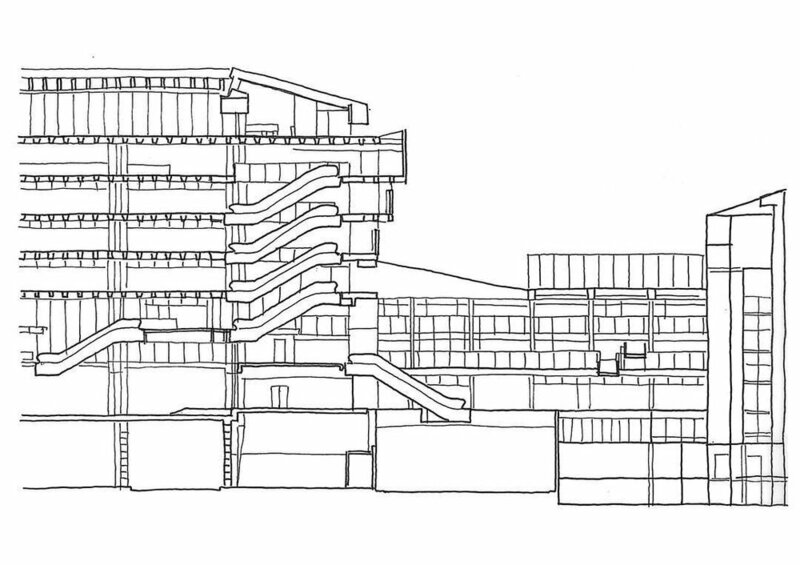 The reference library stood as an eight storey square block with rising cantilevered floor-plates creating the distinctive ziggurat form. The centre of this block was hollow forming the atrium space, which was designed to be accessible and open from all four sides. A square set of reinforced concrete columns support the structure, which stood over the ring road and a bus interchange which was never finished. The floors were made with precast concrete coffered (waffle) units with a cast concrete surface for reinforcement. The external structure was left bare to expose the concrete work and walls were finished with a locally graded aggregate mix, blasted to give a rough textured surface. Architect John Madin originally proposed using Portland stone or Marble, responding to the nearby buildings. However, economic measures taken by the Council and the City Architect saw a cheaper precast concrete mix with limestone and white cement used instead. The building was still built to be hardwearing with low maintenance costs. Something taken full advantage of as the Library had no maintenance work during its entire life. Within the central atrium fully glazed walls were deep set into overhanging concrete balconies. This provided good natural light throughout the building, but reduced solar gain and therefore overheating and damage to books. Large windows faced inwards and high level narrow window strips faced outwards. This created a space that was protected from the noise and distraction of the outside world, a space ideal for study. Internally the building was designed to give a sense of connectivity between the various sections. Madin wanted visitors to experience it as a complete complex in which one would have an idea of all that was there. A succession of smoothly connected volumes created a sensation of flowing spaces, and awareness of all departments from each other. Exploring these spaces was like exploring caverns that held secrets to be discovered; both mysterious and inviting. Something that is magical about a proper library. Madin also designed the semi-circular amphitheatre in Chamberlain Square used to frame the entrance of the library and the new civic square.